Manmohan Singh ( listen); born 26 September 1932) is the 13th and current Prime Minister of India. A renowned economist, he is the only Prime Minister since Jawaharlal Nehru to return to power after completing a full five-year term, and the first Sikh to hold the office. Born in Gah (now in Punjab, Pakistan), Singh's family migrated to India during its partition in 1947. After obtaining his doctorate in economics from Oxford, Singh worked for the United Nations in 1966–69. He subsequently began his bureaucratic career when Lalit Narayan Mishra hired him as an advisor in the Ministry of Foreign Trade. Over the 70s and 80s, Singh held several key posts in the Government of India, such as Chief Economic Advisor (1972–76), Reserve Bank Governor (1982–85) and Planning Commission head (1985–87). In 1991, as India faced a severe economic crisis, newly elected Prime Minister P. V. Narasimha Rao inducted Singh into his cabinet as Finance Minister. Over the next few years, despite strong opposition, Finance Minister Singh carried out several structural reforms that liberalised India's economy. Although these measures proved successful in averting the crisis, and enhanced Singh's reputation globally as a leading reform-minded economist, the incumbent Congress party fared poorly in the 1996 general election. Subsequently, Singh served as Leader of the Opposition in the Rajya Sabha (the upper house of India's Parliament) during the Atal Bihari Vajpayee government of 1998–2004. In 2004, when the Congress-led United Progressive Alliance (UPA) came to power,Manmohan Singh became the Prime Minister of India. 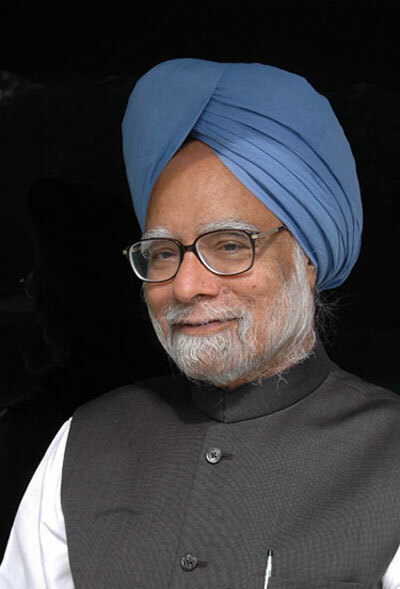 This Singh-led "UPA I" government executed several key legislations and projects, including the Rural Health Mission, Unique Identification project, Rural Employment Guarantee scheme, Right to Information Act and a historic Civil Nuclear Agreement with the United States. The latter nearly caused the fall of Singh's government as anti-American Left Front parties withdrew their support of the UPA. Although India's economy grew rapidly under UPA I, its security was threatened by several terrorist incidents (culminating in the 2008 Mumbai attacks) and a growing Maoist insurgency. Manmohan Singh was born to Gurmukh Singh and Amrit Kaur on 26 September 1932, in Gah, Punjab, British India, into a Sikh family. He lost his mother when he was very young and was raised by his paternal grandmother, to whom he was very close. After the Partition of India, his family migrated to Amritsar, India, where he studied at Hindu College. He attended Panjab University, Chandigarh, then in Hoshiarpur,] Punjab, studying Economics and got his bachelor's and master's degrees in 1952 and 1954, respectively, standing first throughout his academic career. He went on as a Tata scholar to read for the Economics Tripos at Cambridge as a member of St John's College. He won the Wright's Prize for distinguished performance in 1955 and 1957. He was also a recipient of the Wrenbury scholarship. In a 2005 interview with the British journalist Mark Tully, Singh said about his Cambridge days "At (Cambridge) university I first became conscious of the creative role of politics in shaping human affairs, and I owe that mostly to my teachers Joan Robinson and Nicholas Kaldor. Joan Robinson was a brilliant teacher, but she also sought to awaken the inner conscience of her students in a manner that very few others were able to achieve. She questioned me a great deal and made me think the unthinkable. She propounded the left wing interpretation of Keynes, maintaining that the state has to play more of a role if you really want to combine development with social equity. Kaldor influenced me even more; I found him pragmatic, scintillating, stimulating. Joan Robinson was a great admirer of what was going on in China, but Kaldor used the Keynesian analysis to demonstrate that capitalism could be made to work.” After Cambridge, Singh returned to India to his teaching position at Punjab University. In 1960, he went to the University of Oxford for the DPhil where he was a member of Nuffield College. His 1962 doctoral thesis under supervision of IMD Little was titled "India’s export performance, 1951–1960, export prospects and policy implications", and was later the basis for his book "India’s Export Trends and Prospects for Self-Sustained Growth". After completing his DPhil, Singh returned to India until 1966 when he went to work for the United Nations Conference on Trade and Development (UNCTAD) from 1966–1969. In 1969, Dr Singh returned to India becoming Professor of International Trade at the Delhi School of Economics. A technical survey of mainstream Indian economic thinking done by his colleagues Jagdish Bhagwati and Sukhamoy Chakravarty. published in the American Economic Review of 1969, made footnote references to his book in context of planning and protectionism, but not in the main discussion of Indian exports which at the time had to do with exchange-rate overvaluation. Dr Singh told the British journalist Mark Tully in a 2005 interview that after Indira Gandhi’s March 1971 election victory, Parameshwar Narain Haksar invited him to write a political paper “What to do with the victory”. In the 1970s, he taught at the University of Delhi and worked for the Ministry of Foreign Trade with the former Cabinet Minister for Foreign Trade, Lalit Narayan Mishra. As the Minister of Foreign Trade, Lalit Narayan Mishra was one of the first to recognise Singh's talent as an economist and appointed him his advisor at the Ministry of Foreign Trade. Singh and Mishra first met, coincidentally, on a flight from India to Chile. Mishra was on his way to Santiago, Chile to attend an UNCTAD meeting. In 1972 Dr Singh was Chief Economic Adviser in the Ministry of Finance and in 1976 he was Secretary in the Finance Ministry. In 1980-1982 he was at the Planning Commission, and in 1982, he was appointed Governor of the Reserve Bank of India under then Finance Minister Pranab Mukherjee and held the post until 1985.] e went on to become the deputy chairman of the Planning Commission of India from 1985 to 1987. Following his tenure at the Planning Commission, he was Secretary General of the South Commission, an independent economic policy think tank headquartered in Geneva, Switzerland from 1987 to November 1990. In June 1991, India's Prime Minister at the time, P.V. Narasimha Rao, chose Singh to be his Finance Minister. Singh told Mark Tully the British journalist in 2005 "“On the day (Rao) was formulating his cabinet, he sent his Principal Secretary to me saying, `The PM would like you to become the Minister of Finance’. I didn’t take it seriously. He eventually tracked me down the next morning, rather angry, and demanded that I get dressed up and come to Rashtrapati Bhavan for the swearing in. So that’s how I started in politics”. At this time, India's fiscal deficit was close to 8.5 per cent of the gross domestic product, the balance of payments deficit was huge and the current account deficit was close to 3.5 percent of India's GDP India's foreign reserves barely amounted to US$1 billion, enough to pay for a few weeks of imports, in comparison to US$283 billion today. Evidently, India was facing an economic crisis. At this point, the government of India sought relief from the supranational International Monetary Fund, which, while assisting India financially, imposed several conditions regarding India's economic policy. In effect, IMF-dictated policy meant that the ubiquitous Licence Raj had to be dismantled, and India's attempt at a state-controlled economy had to end. Accordingly, Singh, who had thus far been one of the most influential architects of India's socialist economy, slowly opened the Indian economy to foreign investment and business competition. After the 2004 general elections, the Indian National Congress ended the incumbent National Democratic Alliance (NDA) tenure by becoming the political party with the single largest number of seats in the Lok Sabha. It formed United Progressive Alliance (UPA) with allies and staked claim to form government. In a surprise move, Chairperson Sonia Gandhi declared Manmohan Singh, a technocrat, as the UPA candidate for the Prime Ministership. Despite the fact that Singh had never won a Lok Sabha seat, he "has enjoyed massive popular support, not least because he was seen by many as a clean politician untouched by the taint of corruption that has run through many Indian administrations. "He took the oath as the Prime Minister of India on 22 May 2004. Singh has announced that eight more Indian Institutes of Technology will be opened in the states of Andhra Pradesh, Bihar, Gujarat, Orissa, Punjab, Madhya Pradesh, Rajasthan and Himachal Pradesh. The Singh government has also continued the Sarva Shiksha Abhiyan programme, begun by his predecessor, Mr. Vajpayee. The programme has included the introduction and improvement of mid-day meals and the opening of schools all over India, especially in rural areas, to fight illiteracy. Singh's government has worked towards stronger ties with the United States. He visited the United States in July 2005 initiating negotiations over the Indo-US civilian nuclear agreement. This was followed by George W. Bush's successful visit to India in March 2006, during which the declaration over the nuclear agreement was made, giving India access to American nuclear fuel and technology while India will have to allow IAEA inspection of its civil nuclear reactors. After more than two years for more negotiations, followed by approval from the IAEA, Nuclear Suppliers Group and the US Congress, India and the U.S. signed the agreement on 10 October 2008 with Pranab Mukherjee representing India. Singh had the first official state visit to the White House during the administration of U.S. President Barack Obama. The visit took place in November 2009, and several discussions took place, including on trade and nuclear power. Manmohan Singh's government has also been especially keen on expanding ties with Israel. Since 2003, the two countries have made significant investments in each other and Israel now rivals Russia to become India's defence partner. Though there have been a few diplomatic glitches between India and Russia, especially over the delay and price hike of several Russian weapons to be delivered to India, relations between the two remain strong with India and Russia signing various agreements to increase defence, nuclear energy and space cooperation. Singh has always been perceived as a man of clean background. He is seen as a man of few words. The Independent described him as "one of the world's most revered leaders" and "a man of uncommon decency and grace," noting that he drives a Maruti 800, one of the humblest cars in the Indian market. Khushwant Singh lauded Singh as the best prime minister India has had, even rating him higher than Jawaharlal Nehru. He mentions an incident in his book Absolute Khushwant: The Low-Down on Life, Death and Most things In-between where after losing the 1999 Lok Sabha elections, Singh immediately returned the INR2 lakh (US$3,600) he had borrowed from the writer for hiring taxis. Terming him as the best example of integrity, Khushwant Singh stated, "When people talk of integrity, I say the best example is the man who occupies the country's highest office." In 2010, Newsweek magazine recognised him as a world leader who is respected by other heads of state, describing him as "the leader other leaders love." The article quoted Mohamed ElBaradei, who remarked that Singh is "the model of what a political leader should be." Singh is number 18 on the 2010 Forbes list of the world's most powerful people. Forbes magazine described Singh as being "universally praised as India's best prime minister since Nehru" Australian journalist Greg Sheridan praised Singh "as one of the greatest statesmen in Asian history." Singh's public image has been tarnished recently with his government having been accused of corruption scandals since the start of its second term in 2009. Time magazine's Asia edition for 10–17 July 2012 week, on its cover remarked that Singh was an "underachiever".] The issue of the magazine claimed Singh appears "unwilling to stick his neck out" on reforms that will put the country back on growth path. Congress spokesperson Manish Tiwari rebutted the charges. UPA ally Lalu Prasad Yadav took issue with the magazine's statements. Praising the government, Prasad said UPA projects [were] doing well and asked, "What will America say as their own economy is shattered?". Political opponents including L.K Advani have claimed that Singh is a "weak" Prime Minister. Advani declared "He is weak. What do I call a person who can't take his decisions until 10 Janpath gives instruction." The Independent, a British daily also claimed that Singh did not have genuine political power. Singh married Gursharan Kaur in 1958. They have three daughters, Upinder Singh, Daman Singh and Amrit Singh. Upinder Singh is a professor of history at Delhi University. She has written six books, including Ancient Delhi (1999) and A History of Ancient and Early Medieval India (2008). Daman Singh is a graduate of St. Stephen's College, Delhi and Institute of Rural Management, Anand, Gujarat, and author of The Last Frontier: People and Forests in Mizoram and a novel Nine by Nine, she is married to an I.P.S official Ashok Patnaik who is on deputation to Intelligence Bureau. Amrit Singh is a staff attorney at the American Civil Liberties Union. Singh and his wife both belong to the Kohli clan, though neither uses the name as their surname. Singh's personal assets amount to five crore rupees (approx 1 million USD). He has property worth Rs 1.8 crore, a Rs 90 lakh house in Chandigarh and a Rs 88 lakh apartment in Vasant Kunj in Delhi. His bank deposits amount to Rs 3.2 crore. "it is very very nice"